Alaska cold temperatures are notorious for causing frozen pipes, sewer lines, drains, and even inside pipes and lines. 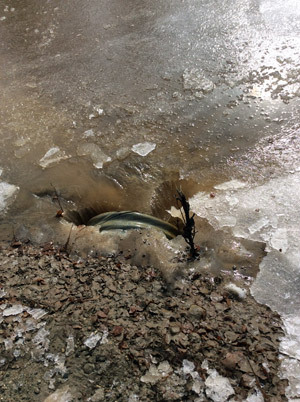 Is a frozen culvert causing your yard to flood or worse? 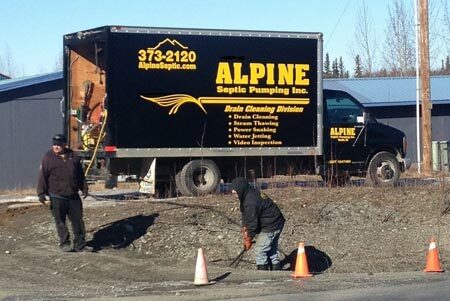 Alpine Septic Pumping steam thawing can thaw pipes, lines, or culverts and get water flowing again. Our steam equipment is also great for frozen septic lines, ground lines, septic tanks, drain lines, etc. If steam can thaw it, we can do it. Do you have a frozen septic or sewer line? Our professionals can help and most times we we can quickly determine if it’s a frozen line clogged drain causing the issue. Sometimes our customers believe they have clog and it’s really a pipe or line that has frozen, or the other way around. Our trained crew can usually determine what the problem is. We have state-of-the-art video inspection cameras that can quickly diagnose the real cause of the block or clog and we can usually get the problem fixed up fast.